I previous wrote about how much I liked the Serfas Thunderbolt USB Taillight. Well now I have even more reason to like it. A couple of weeks ago, a plastic piece inside the USB connector broke off. This is the same plastic piece you see on all female mini USB connectors. I think this is bad design on USB’s part, not Serfas. I assume it broke because of the almost daily plugging in to be recharged. I was about to order a new one, but decided to check out their warranty page: Serfas Warranty I emailed their warranty email address about my problem and got a response within 30 minutes. They said to mail it in and they would fix or replace it. I mailed it in and about a week later I got a package at my door with a brand new Taillight. This is an awesome product from a company who stands behind their product. I highly recommend it. You can buy the Serfas Thunderbolt on Amazon I’ve already bought one for my kids. For the past nine months, I have been riding my bike to work. It’s a little over 7 miles each way. During the summertime, there is plenty of light in the morning and evening. In October of 2013, when it started getting darker earlier, I had to upgrade my bike lights. I ended up with a Lumina 700 for my headlight and a Serfas Thunderbolt for my taillight. I’ve been very happy with both. I’ve had other bikers, people in cars and people on the road ask me about both of them. They’ve been impressed about how bright they are. Here are some more details. It has three levels of brightness. It’s plenty bright to light up the dark road on my route where there are no street lights. It’s rechargeable via USB. I usually charge at night, but when I forget it’s easy to plugin at work. 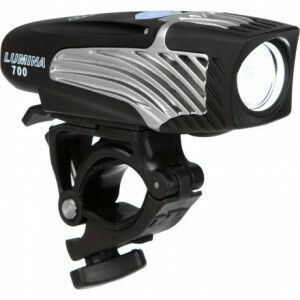 You can read all the specs at the Lumina 700 product page. It’s a great light and I highly recommend it. You can buy the Lumina 700 on Amazon for $97. That about $20 cheaper then when I bought it. It’s the brightest taillight I’ve ever seen. I’ve had several people comment on that. It mounts on the seat post and is very easy to put on or remove. You can read all the specs at the THUNDERBOLT (USB) TAIL LIGHT. You can buy the Serfas Thunderbolt on Amazon for $36 – $45 depending on the color.